Promolux® Safe Spectrum® lamps are ideal for maximizing the shelf life and merchandising presentation of cut flowers, frozen foods, ice cream, dairy products and processed foods packaged in jars or transparent films. Safe Spectrum lamps are ideal for maximizing shelf life. 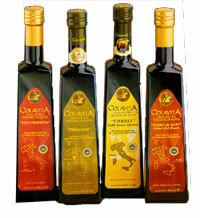 Olive Oil Essentials: Preserving and Storing Olive Oil. Italian Cooking & Living. Italian Culinary Institute. Read the full article here. Lighting Effects on Packaged Foods. J.C. Acton and L.K. Cook. 2002 Annual Meeting and Food Expo - Anaheim, California. Read the full article here. "Since oxidative rancidity is a pure chemical reaction (not enzyme catalyzed) its rate is highly dependent on temperature. The rate of reaction will double with every 10° C increase in temperature."